I had no idea I have so many friends who’ve visited Istanbul. That was one of my thoughts today playing around with Traverie, a new vacation-picking site that sources all of its content from the Facebook friends of its users. It’s like a free travel magazine that eschews articles for a direct line to globe-trotting photographers you already trust — or, at least, trust enough to friend on Facebook. In a big-picture sense, CEO Gaurav Agarwal ambitiously described Traverie as one of the next steps in the evolution of the Web. Just as search engines made manageable the growing amount of public information online, Agarwal said, “discovery engines” like Traverie will keep our friends’ best pictures from getting lost in the flood of the social Web. (Anecdotally, this rings true for my experience. I usually visit Facebook multiple times a day, but there are literally thousands of photos I skip over when they fly by in my news feed. And, when I’ve handed over my own travel photos to the site, it’s unusual to hear from anyone about them beyond the people who were on the trip with me and the occasional friendly stalker). 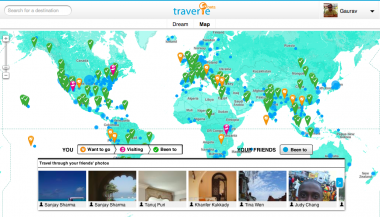 After connecting the site to their Facebook profiles, users are greeted with two options: “Dream,” which lets them browse photo galleries city by city, and “Map,” which is, um, a map. The “Dream” section is more useful, since it’s easier to see at a glance exactly how many people have been somewhere, and who they are. Once they see a picture of a place they want to go, users can click a button to add it to their “Bucket Lists.” And to find out more about the specific picture, Traverie encourages them to comment on the photos, which in turn will ping the photographer on Facebook. One of the clever pieces of Traverie’s elegant design is that it doesn’t keep photos from Facebook in the same order it received them. Rather, the site organizes them based on their metadata (i.e., whether or not the person who took the picture has highlighted it by giving it a caption) and based on what Traverie users have clicked on. Agarwal is quick to point out, though, that he’s sensitive to privacy concerns: The pictures you see on Traverie, he said, are the same ones you’d be able to see on Facebook.com, just reorganized for a specific purpose. 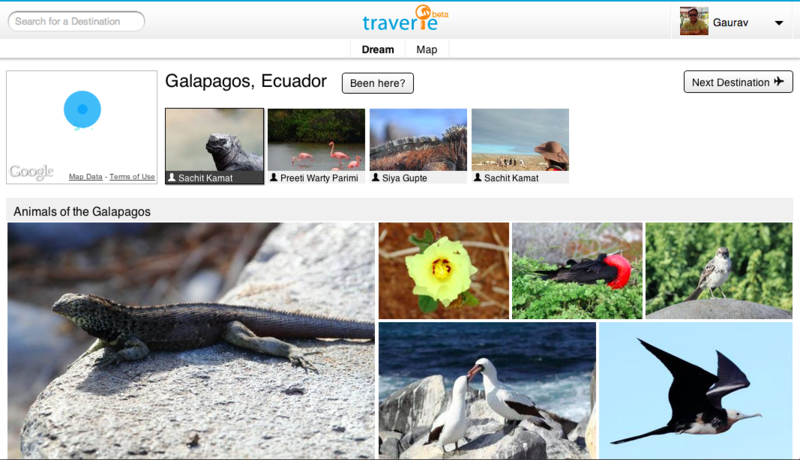 Traverie will eventually be able to bring in pictures from other social networks, like Dropbox, Flickr and Instagram. And, Agarwal said, he hopes to monetize the site by bringing non-photo content into the discovery process. 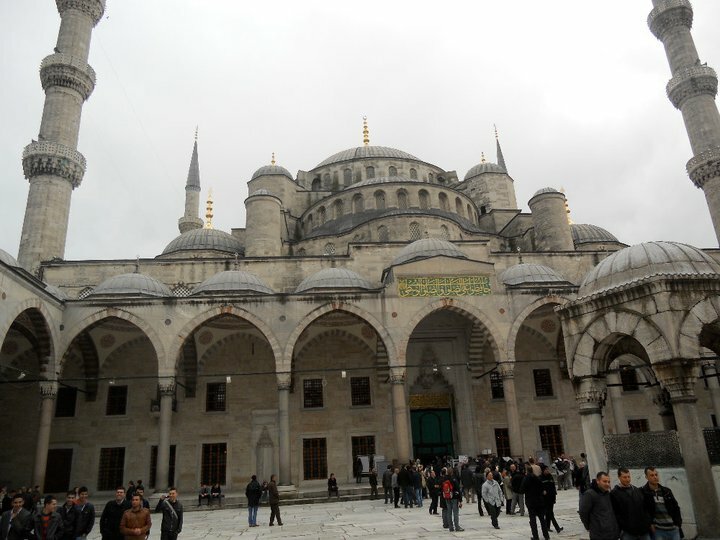 So, if you’re looking at pictures of the Blue Mosque, the site might one day suggest other experiences, hotels nearby where you can stay, or even editorial content about Istanbul, bringing the travel magazine comparison full-circle. For now, though, I’m happy enough just looking at all these pretty pictures. Top image courtesy of Emily Jones.